Amazing facts about people, animals, Earth, and space pack this fantastic kids book of world records. 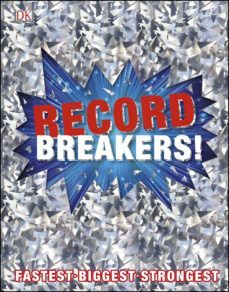 Its the perfect gift book for children aged 9-11.Record Breakers brings you the first, fastest, longest, largest, biggest, and best records in the world. Track the longest shark migration (20,000 km/12,400 miles); visit the coolest place on the planet (Vostok Station, Antarctica: a chilling -89.2ºC/-128.6ºF); see how plane pioneer Chuck Yeager first broke the sound barrier, and much more. The greatest human achievements are showcased, from pioneering inventors to modern feats of engineering, technology, transport, and sport. But theres far more than just people power in the book, there are also records about animals, plants, and our amazing natural world, Earth, and space.Find out all about the best of everything in Record Breakers - an entertaining and educational book for all the family.